You know, when we first moved in here, I had no plan. This house has SO much storage - I just didn't know what to do with it all. So I pretty much threw everything in wherever it would fit, knowing there'd still be so much space I could still find everything(*snort*), and that I would have plenty of time to sort it all out. Fast forward 3 years. Yep, it's all still there where I threw it. Funny how that works.....sigh. Every spring I think I'll get on it, but so far, I haven't. This year, since I'm no longer working or even making patterns, I'm on a mission. My main motivations is....spiders. There are two huge trees right next to the house, a balcony under them where they breed, and none of the doors and windows fit properly. You would not believe what gets in here. The best way to keep them from breeding IN the house is to clear out all the clutter, and make it easy to keep clean. Today, I started with the most important room in the house, the sewing room. Every drawer, every cupboard. This box above is all of my patterns that I've purchased over the years. And it does go back years - there are many more that are on my computer!!!! I went through all of my books from all their scattered locations - and after removing all the patterns from my book cupboard, all the books fit!! There's even room for more. 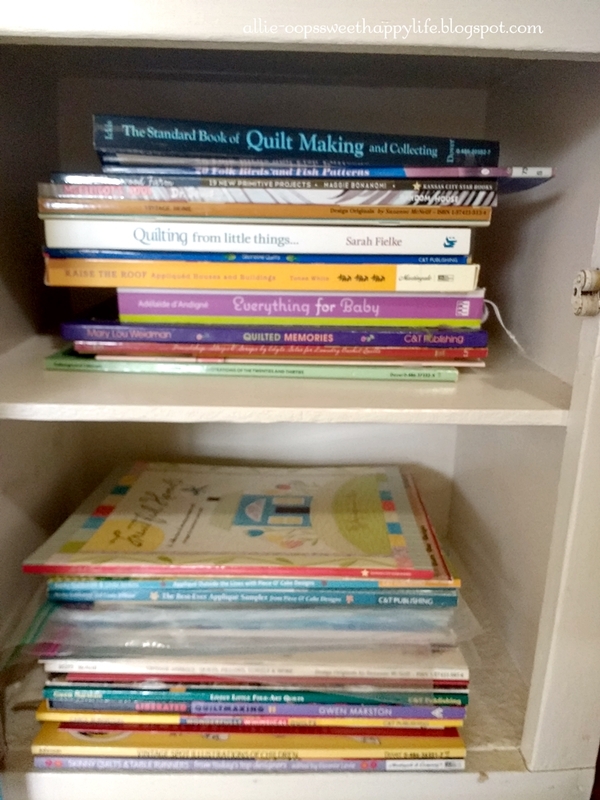 I won't show you the top of the cupboard, that holds all of my own patterns, and they are an unholy mess. I'm saving that for a rainy day. I went through all the drawers in my dresser, found two plastic shoeboxes that now hold office supplies and trims. Everything in order, how I love it. Maybe now I can find things! I still have to clean out the china cabinet, clean out the bookshelves and sort through fabric, but wow I feel so much better. We used to have a book called The Taxi That Hurried, when the boys were small, and I drew the taxi and made a pillow for my boys. Apparently I also traced their handprints - those are from 1997, when my oldest was 5 and youngest 3. What a treasure. So - being that I'm on a mission, you won't hear from me much for the next little bit. I intend to clear out the entire house. The enormous linen closet upstairs has boxes with who knows what in them, hopefully no spiders. 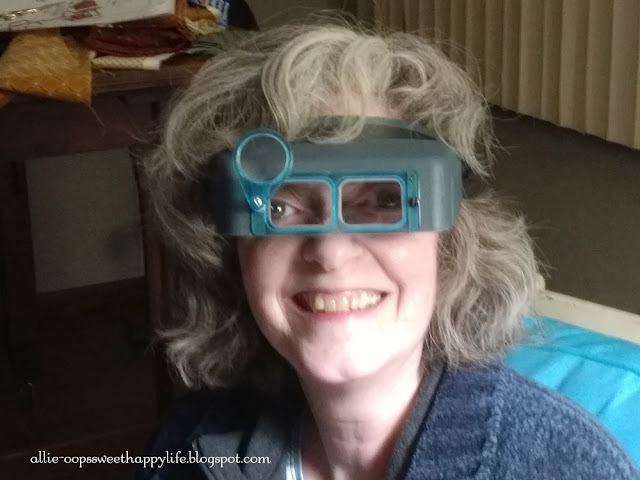 I'll leave you with a picture my son took of me, with his special headgear for working on pens - we were cracking up at how it made our eyes look, and had to take pics!!!! I think we have a lot of the same books, and more than i will ever be able to use. That is such a fun find, hopefully when we dig through our cellar mess, I will find some treasures. 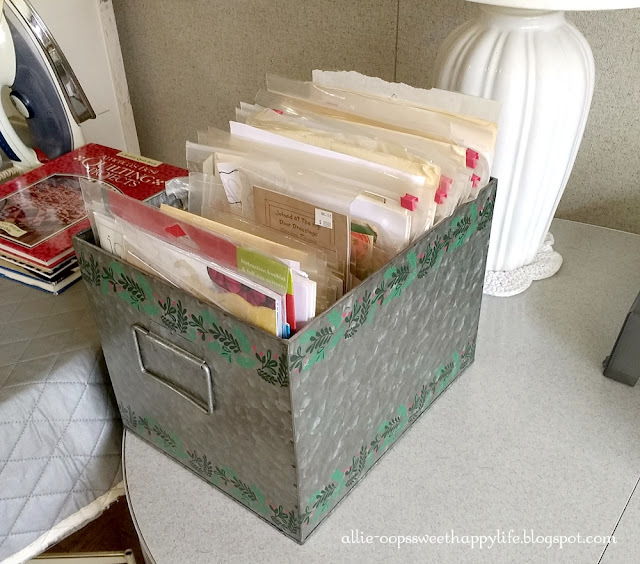 I'm working on organizing my sewing/craft rooms. Good luck "treasure hunting". Good for you, Allie! I wish you luck with your cleaning. When you are finished, can you come and do my house? Just kidding! I have not had the strength to clean in years. My husband is such a sweet heart and does the vacuuming about once a week. But he doesn't know what to do with all of my stuff so it just sits there. I keep trying to get at it. Maybe thinking about what you are doing will give me a little incentive! Wow what a mission! It will be great to have it all organized. I see you have that spring cleaning bug too. I just cleaned and organized my garage that hasn't been touched in 25 years. Can't believe the things I found and forgot that I had. Love that picture of you. Memories are so nice! Have fun! I will be your cheerleader since I'm still down with knee replacement surgery. lots of pain. but I'm trying to muddle through with the Lord's help. Way to go Allie-girl!! I can 'hear' the joy in your words...and girl, love the new glasses. LOL!!! 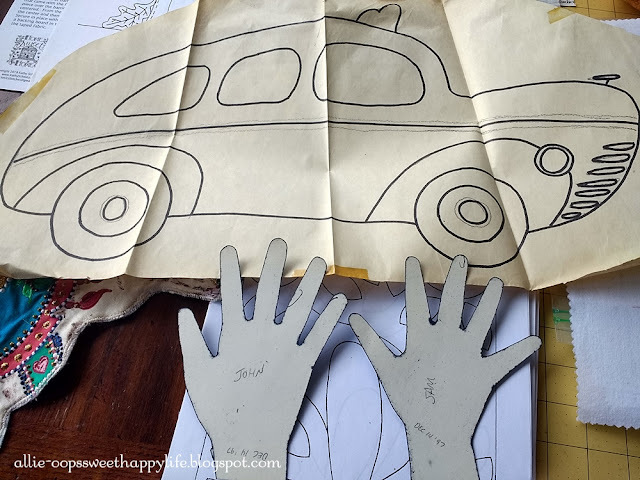 Love the treasure you found while cleaning through your shelves and cupboards - the taxi and drawn hand prints!! Enjoy your cleaning :)! Cute pic of you and the intricate glasses! Wonderful treasures! And did you now that you had that many books? 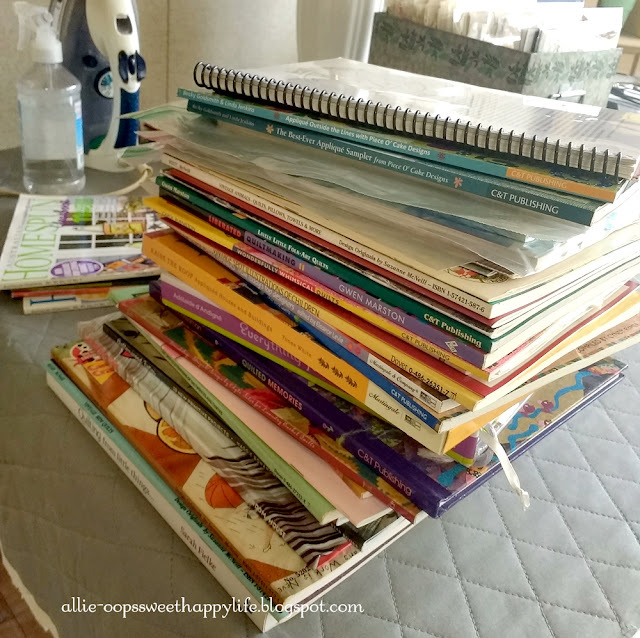 I think I have 5 quilting books but oh so many cross stitch patterns! When you're done at your place, wanna come over and do my sewing room? Seriously, I need to get in there because I have a big quilt project coming up and I need to clean in there before I can even start ironing the yardage needed for it! And did you know there are plants that deter spiders? I don't know if you need to plant them indoors or outside but peppermint and mint is supposed to keep spiders, mosquitoes and ants away. Good luck with your mission! Go for it girl!!! When you are done, you can come and do mine. Love your big eyes! That's a cute metal container you have your patterns in! More power to you in getting all of your storage spaces organized. I wish I could come help you, I LOVE organizing! Well, I should say I love organizing other people's stuff. You would never know it to look at my own sewing room! Good luck with your new project. I hope you find the perfect spot for everything and maybe even cull out some things you don't need anymore. Doesn't it feel good to go through the old stuff and get it in order. What a delightful surprise to find your precious memories safe and sound. Have fun Spring Cleaning and get those darned ole spiders outta there! Hugs, Dear, from our visiting Texas. It feels sew good when I can get everything cleaned up and organized. Lately I have been taking one room at time. I know what you mean about spiders. We live in the country and they love our garage.